Weligama, situated 30 km east of Galle, is a traditional fishing town of about 70.000 inhabitants at Sri Lanka’s southern coastal belt. It has become a popular beach resort in recent decades. The beach is namegiving, as Weligama translates to “sandy village”. Although the coastal road (A2) is less appealing, the curved sandy beach framed by outcrops and palm groves is pretty attractive. Near the western promontory are several smaller coves such as Fisherman’s Bay, Turtle Bay and Jungle Bay. The eastern promontory is the headland of neigbouring Mirissa at the opposite side of the river mouth of Polwatta Ganga. Regrettably, the beauty of the eastern end of the beach is partially impaired by a monotones concrete cuboid. Maybe, the best way not to be disturbed by that kind of dismal run-of-the-mill architecture is to rent a room in the upper storeys of the Marriott Hotel to enjoy the vistas to the sandy beach. However, several boutique hotels can be found in Weligama, too. The most stylish one is definitely the former villa of Count de Mauny on the islet of Taprobane. The stretch of the beach near the islet of Taprobane is the most picturesque one of Weligama Beach. Dozens of traditional outrigger boats can be seen here after their night fishing expeditions. Although Weligama is a crescent bay and more protected than other sandy beaches of Sri Lanka’s coasts, swimming shoulf be done with caution, for two reasons. Firstly, strong underwater currents can occur. Secondly, there are many unexperienced surfers. Surf etiquette standards are comparatively low in Sri Lanka. Multiple surf breaks are within walking distance along the coast. The main surfing spot is a left-hand reef break with an easy take-off, perfectly well suitable for novice surfers, allowing rides of up to 400 m on a slow wave. Surfing schools are available in Weligama and surroundings. More advanced surfers prefer the breaks at Mirissa 5 km further east and Midigama 5 km further west. Weligama and Kogalle are the focal points of stilt fishing photos. A few dozen meters off-shore, stilt fishermen can be seen perched on a small cross bar of the vertical stilt. Stilt fishing has become a kind of exotic landmark and title page of Sri Lanka’s tourism broschures and pocket guidebooks. But to be honest, stilt fishing is not done any more for catching fish ut for collecting tips from tourists who take photos. Don’t be disappointed. Without this business aspect, being part of the tourism industry, there wood be no stilt fishing at all in Sri Lanka. This would be regrettable. Whether done for a fish meal or for a tourist’s tip, the men on a single pole off-shore perching on a cross bar and using bamboo fishing rods are definitely worth a photo. The real fishing in Weligama is done from boats. By the way, the colourful outrigger boats are photogenic, too. The most enchanting feature of Weligama beach is the islet called Taprobane. It is said to be the birthplace of the scholar monk Weligama Sri Sumangala. 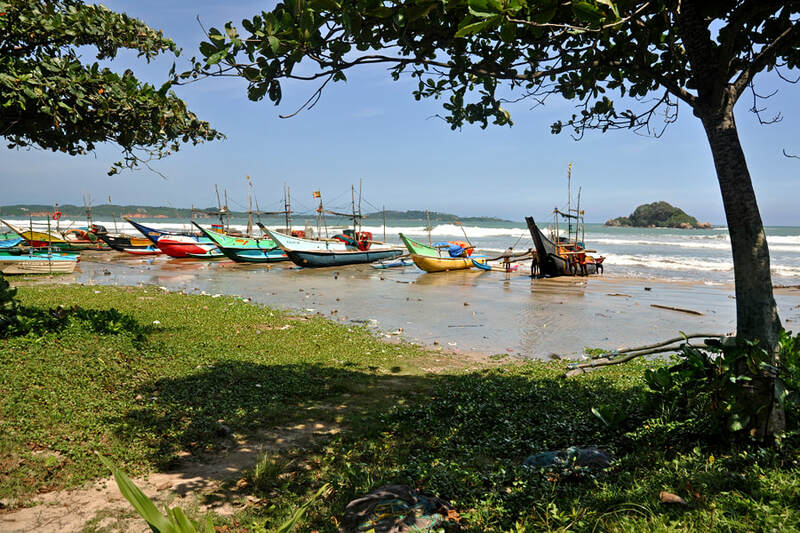 As a matter of fact, “Taprobane” is is a phantasy name of recent origin, as the term Taprobane referred to the entire island of Sri Lanka in ancient times. The original Sinhala name is Galsuwa, which translates to “rock islans”. The islet is situated just 200 meters off shore of. It’s crowned by a red-tiled white villa, which was by the Maurice Talvande (1866–1941), a French-born naturalised British artist, better known under his self-styled name Count de Mauny, who purchased the small land. The landcape gardener and architect designed the villa, the furniture and garden of his private paradise, which became a meeting place of the colonial high society. Today, the island villa is one of the most notable boutique gotels of Sri Lanka. It consists of 5 suites and a modern infinity swimming pool. Weligama is well-known for its tradtional lace-making, known as Beeralu in Sinhala. Beeralu lace making is considered to be a legacy of Portuguese colonization. Today only a few of women still continue this craft, mainly in the harbour neighbourhood of Galle and in Weligama. The lace is mainly produced in private households. As Weligama is a popular tourist destination, there are guesthouses and hotels of several categories available. Particularly, Weligama hosts several boutique hotels.